the largest city and capital of Ceylon, is located near the mouth of the Kelani River on the Indian Ocean. Occupied by the Portuguese in 1517, the Dutch in 1658 and the British in 1796, Colombo became a major British defense base. The tram system opened in September, 1898, and by the 1940's had 7.5 miles of track and 52 cars. 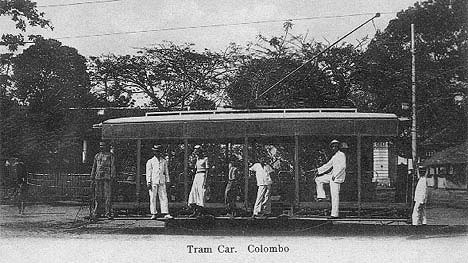 The tram shown on the postcard was one that connected the Old Fort area with the suburbs of Pettah and Borola. The system closed in 1960.